Thank you for accessing the website (the "Site") of S.O.U.L. : Supporters Of Unfettered Love, LLC., ("S.O.U.L.," "we" or "us"). At S.O.U.L, we are committed to protecting the privacy and security of your personal information. S.O.U.L. reserves personally identifiable information for business purposes: to deliver THESOULBAG products and related support, manage customer accounts, create mailing lists, and to provide customer support. S.O.U.L. will by no means sell or share your personal information with any third party not involved in a transaction through our website. Your privacy is very important to us! S.O.U.L. collects and uses some non-personally identifiable, basic data about our users as a means of measuring the helpfulness of our Web site. S.O.U.L. 's servers identify certain user information in the usual course of operation, although this information does not reveal a user’s personal identity. This information includes but is not limited to, IP addresses, browser types, operating systems, content accessed, and date and time of such access. From time to time S.O.U.L. will request to use parts of the written information you voluntary send to us, such as positive feedback or parts of your personal story as it relates to S.O.U.L. 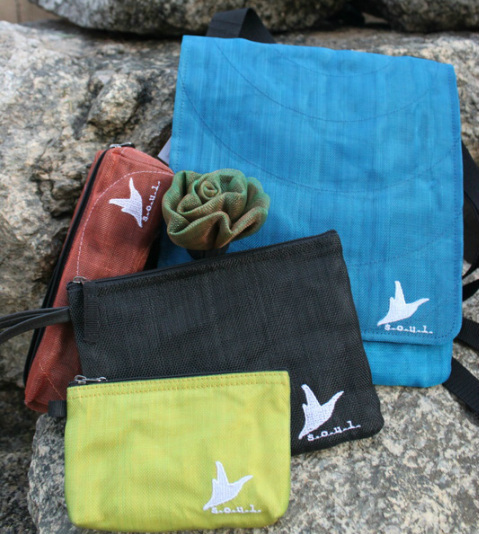 and THESOULBAG collection. You will be notified by email if this is the case. We will not use any of your personally identifiable information for these purposes. S.O.U.L. takes reasonable precautions to protect individually identifiable information against loss, misuse, alteration, unauthorized access and disclosure. Information is only accessible to authorized personnel who need it in order to perform their jobs. S.O.U.L. reserves the right to release any information or data collected by or about a customer to any government agency or person upon search warrant, court order, subpoena, or any other legally binding means under the laws of the United States of America. S.O.U.L. may also allow access to this information under exigent circumstances to protect the personal safety of customers or the public or the safety and integrity of our Web site and servers.